The National Parliament, in a Plenary Ordinary Session, on September 12, 2017, unanimously elected the members of the Board of Directors, with 59 votes in favor, 0 against and 0 abstentions. The members of the Board of Directors elected are: Aurelio Freitas Ribeiro (FRETILIN, effective), Noémia Sequeira (FRETILIN, alternate), Manuel Tomás de Carvalho (PD, effective), Ernesto Fernandes «Dudu» (PD , Deputy Armanda Berta dos Santos (KHUNTO), José Agostinho (KHUNTO, alternate), Brígida Antónia Correia (CNRT, effective), Mr Patrocínio Fernandes dos Reis (CNRT, deputizing for Deputy Merícico Juvenal dos Reis (PLP, effective) and Signi Candrawati Verdial (PLP, alternate). On the same day, the National Parliament also approved Draft Resolution No. 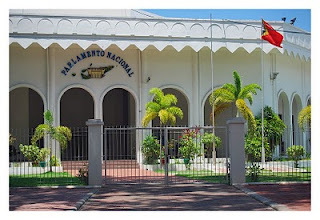 3 / IV- Anticipation of the normal period of operation of the 1st Legislative Session of the Fourth Legislature, and also gave assent to the President's move abroad. This Plenary Session was chaired by the President of the National Parliament, Aniceto Longuinhos Guterres Lopes, accompanied by Vice Presidents Júlio Sarmento da Costa "Meta Malik" and António Verdial de Sousa, by the Secretary of the Board, Lídia Norberto dos Santos Martins and the Vice Secretaries , Elvina Sousa Carvalho and Angelica da Costa.